Writer Matt Ford (Love Child, House Husbands, Satisfaction) has been named as the winner of the inaugural Hothouse Drama Program conducted by Nine, Screentime and Scripted Ink. His script Alice Black will go into the next stage of development with Screentime. 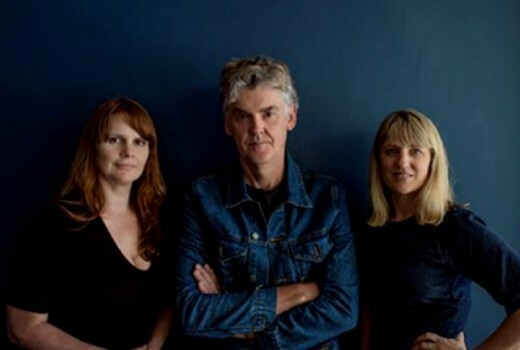 Ford (pictured, centre) was a finalist of the drama initiative along with Jacklyn Bassanelli (creator of Evergreen and script intern on Wentworth S7), and Jessica Brookman (Nowhere Boys, The Secret Daughter, Neighbours). Each developed two story ideas, pitching their drama concepts to Nine and Screentime. It’s funny to remember once upon a time this guy (as Pinky Beecroft) made, um, unusual contributions to shows like The Glass House, possibly Good News Week as well? Anyway, congratulations, Matt.